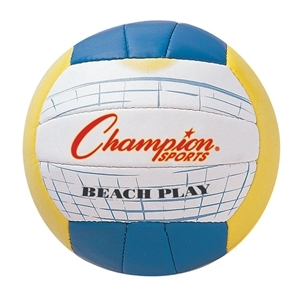 Champion Sports Volleyball & Badminton Champion Sports Beach Volleyball. Sports Facilities Group Inc. Designed for beach and outdoor use, the Champion Sports Beach Volleyball is made with a synthetic leather cover for comfort and durability against the elements, especially water and sand. As well, the 2-ply bladder offers superior air retention, ensuring the volleyball remains inflated throughout games and practices.